BEIJING-China launched another attack on exiled Tibetan spiritual leader the Dalai Lama on Wednesday even as his envoys and Chinese officials had a second day of secretive fence-mending talks. Zhang Qingli, Tibet's hardline Communist Party boss, repeated government claims that “riots” in Tibet in March were instigated by the “Dalai clique”—Communist jargon for his supporters—who were intent on causing a bloodbath. “The March 14 incident was planned for a long time by the Dalai clique with the support and instigation of hostile Western forces,” the Tibet Daily paraphrased Zhang as telling a visiting delegation from an organisation of the disabled. “They harboured the evil intention of turning the incident into a bloodbath, of disrupting the Beijing Olympics and destroying Tibet's stability and political harmony,” he added. The Dalai Lama has denied the charge. Other state media were largely silent on the talks, which could burnish the country's international image weeks before the Beijing Olympics, referring only to Foreign Ministry comments that China opposed any nation's leader meeting the Dalai Lama. Thubten Samphel, secretary of the Tibetan government in exile's Department of Information, told Reuters the talks would likely continue until the evening, but added he had no details about how the they were going. Samphel hit back at Zhang's latest attack on the Dalai Lama, though. 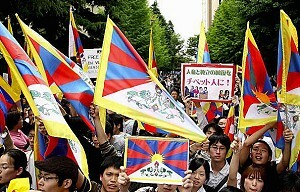 “These protests are taking place because of China's wrong policies being implemented in Tibet. If there is anyone to blame it's the Chinese authorities,” he said. It is their second closed-door meeting since rioting erupted in Tibet in March which heaped international pressure on China to deal with the Nobel laureate, who fled into exile in India in 1959 after an abortive uprising against Chinese rule. The round of talks, the sixth since 2002 and delayed by three weeks in the wake of China's deadliest earthquake in three decades, was preceded by a glut of goodwill, arguably somewhat more from the Dalai Lama's side than China's. During a trip to Britain in May, he said he was willing to attend the Aug. 8-24 Beijing Olympics if talks between his envoys and China yielded results. He did not elaborate. The Dalai Lama says he wants autonomy for the Himalayan region. But China is unconvinced and brands him a separatist.